I'm always trying to dream up new cocktails, it's my thing. Went to Pizzeria Vetri on Chancellor Street in Center City Philadelphia a few weeks back, and we were there in time to take advantage of Center City Sips Happy Hour specials - $5 cocktails, $5 apps, and $3 beers. 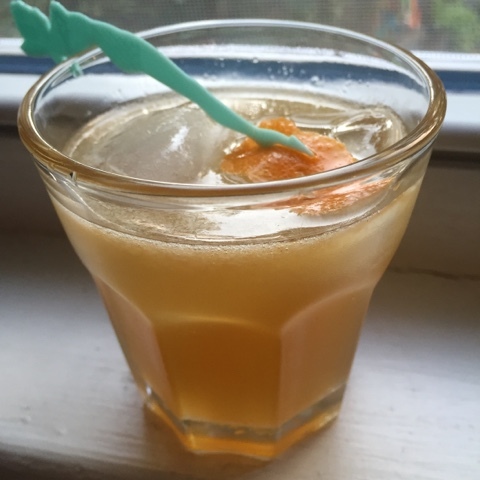 Their summer cocktail, a combination of whiskey, lemonade and rosemary simple syrup was refreshing and not too sweet. Went down smooth. I made myself have only one, but my friends enjoyed several more. Inspired by this combination, I sought to make something similar at home but I discovered I had no lemons. We did have limes, clementines and several lovely bottles of flavored syrups and shrubs. 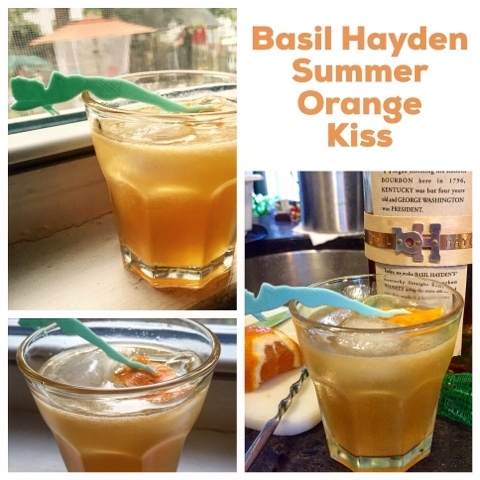 I grabbed the lavender syrup and whipped up this sweet bourbon kiss. You can use oranges instead of clementines, but I do suggest you use either a lavender simple syrup or something that's infused with citrus, lavender, rosemary, or mint. 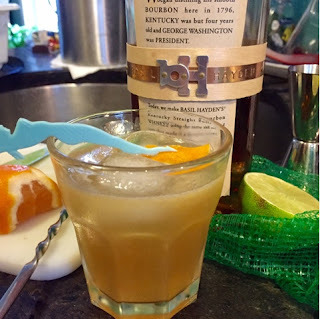 A lighter bourbon will work with this drink, something mild, light and smooth. Basil Hayden was a Christmas gift and I love it straight up. It also makes a nice light cocktail. Orange bitters round out the flavor components, perfuming the entire drink. Add a slice of clementine to a cocktail shaker and add in 2 dashes of orange bitters. Muddle the orange segment to release its juices and essence. Add ice to the cocktail shaker and the juice of half of a Clementine, juice of half of a lime, a jigger of light bourbon and a tablespoon of lavender syrup. Close shaker and shake vigorously. Strain and serve the drink in a rocks glass filled with 2 ice cubes or preferably a large round or square ice cube. Garnish with the zest of the clementine. ** To make your own simple syrup, it is truly simple to do. Take 1 cup of white, granulated sugar and 1 cup of fresh water. Add them to a small sauce pan and over medium heat, heat the mixture until the sugar dissolves into the water and the water turns clear and syrupy - about 5-6 minutes. To infuse the syrup with a flavor, add in cleaned pieces of: sprigs of rosemary, or a handful of mint leaves lightly crushed, or a few springs/stalks of clean lavender. Allow the herb of choice to steep in the syrup for 15-20 minutes over low, barely simmering heat, do not boil or allow the mixture to reduce down. Let the syrup cool then then remove the herbs and discard them. Strain the syrup through a fine mesh strainer to remove any particles and decant into a clean glass jar or bottle. Cover and refrigerate. The syrup will keep for at least a month in the refrigerator. To keep it longer, add in several drops or a teaspoon of a neutral spirit such as vodka, to keep any bacteria from forming. Discard if the syrup looks cloudy, moldy or funky! Syrup can be used to flavor iced tea or iced coffees.